NYJTL’s FACES: Family & Community Engagement Series provides opportunities to South Bronx families surrounding Crotona Park to play tennis, have fun and engage in experiences on and off the court. Families enroll as a group and commit to youth tennis lessons, family play days and parent workshops exploring ways to keep the entire family healthy. FACES families reflect the Crotona community, which is 70 percent Hispanic. Often, parents are fluent Spanish speakers with limited English proficiency. In an effort to make programming accessible and inclusionary, all workshops, resources, materials discussions are offered in both English and Spanish. 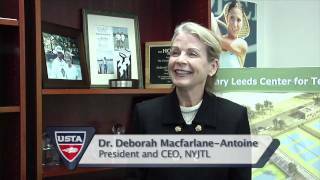 For more information, please contact Jisbel Barada, jbarada@nyjtl.org.